Legend has it that 9th-century goat herders noticed the effect caffeine had on their goats, who appeared to “dance” after eating coffee berries. Adventure Trail Guide and Bike Shop Owner. A beermosa and a second cup of coffee. It would have to be sitting down with Tom Waits. 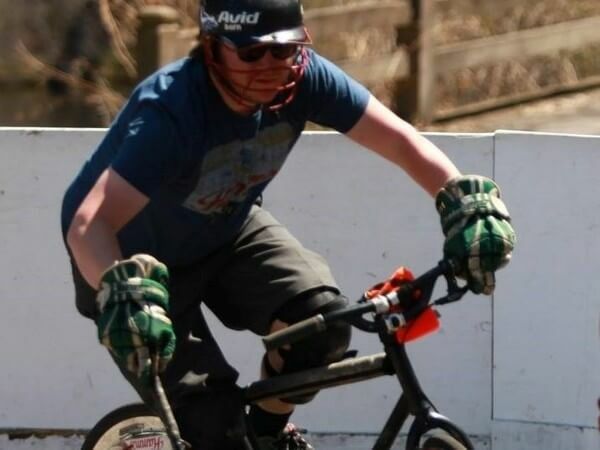 Getting rad on the court with my home club Twin Cities Bike Polo. I am confident that bike shoes go with everything. I would want to go play bike polo with the European leagues. That being said it would be Austria. It would have to be my sideburns. Racing a desert storm when I worked down in Cimarron, NM at the Phimont Ranch. Just seeing the lighting crack in the desert sky has always stuck with me. 80s Hair Metal. Lately, it’s been Iron Maiden.